Fickle Prickles - Cacti & Succulents: What are Grafted Cacti? When people see these unusually coloured cacti, quite often they are mistaken as flowers. But in actual fact they are two different species of cacti grafted together. The brightly coloured cactus that sits on top is actually a mutant variation of a standard cactus. In the wild, if a mutant pup is created, eventually it would detach from the parent plant and sadly die as it cannot photosynthesise. The reason it can’t photosynthesise is because it has no chlorophyll (green pigments), which is essential in the photosynthesis process. So in order for a mutant pup to survive, we have to find some other means to give it nutrients. This is where the grafting comes in. Rootstock plants, which are able to photosynthesise normally, are what the mutant pups are grafted on to. They can provide enough nutrients for both itself and its grafted partner, allowing both to survive. 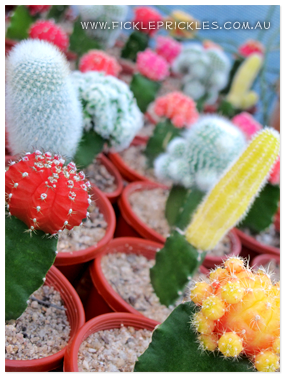 Common rootstocks used in grafting cacti include species of Hylocereus (what we use here at Fickle Prickles), Myrtillocactus geometrizans, Trichocereus pasacana, Harrisia jusbertii, Cereus peruvianus and many more. Most of the colourful mutants you will see around are derived from the species Gymnocalycium mihanovichii and Lobivia silvestrii variegate. However, the possibilities of grafting are endless, and not just limited to mutants. The white cacti in the photo above aren't actually mutants at all, but are still visually stunning and offer wonderful colour contrasts to mini cactus gardens. Place these guys indoors or sheltered under verandas or patios as the rootstock is sensitive to the cold and frosts. They do need partial sun, so next to a window is the perfect location if they are indoors. Very little maintenance is required for these guys to thrive; in fact one of the main reasons grafted cacti suffer is through over watering. Water them sparingly, only when the soil is dry (this can take anywhere from a week to a month depending on location, time of year and environmental factors). The best thing to do is water them thoroughly and then let it drain. If you are using saucers, make sure to empty them out after each watering. Mealybug - How to get rid of them and keep them away for good!